The BC FIRST Tech Challenge robotics tournament was held February 17 2018 at St. Michaels University School in Victoria BC. 20 teams from British Columbia, Alberta, and Washington State participated. There was some great robot action with robots scoring high in the FIRST Relic Recovery robot game. Congratulations to team 418 S.K.I.D from Washington State, the captain of the winning alliance in the robot game. Congratulations to team 6220 Centripetal, also from Washington State, who took home the Inspire Award. They will advance to the FIRST Championship in Houston Texas. As the field technical advisor I had a great view of the robot games. 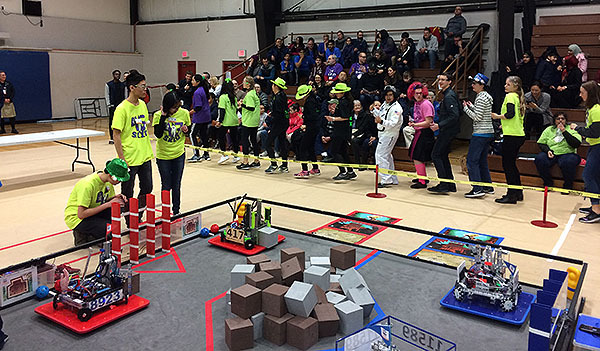 Here’s a picture of teams line dancing during a pause between matches during the elimination rounds.